For a ceremony resolute in tradition and with a touch of splendour from centuries past, the Peacock Mandap offers a grandiose and decadent twist to the architectural designs which adorn traditional weddings the world over. Offering breath-taking wooden pillars carved with precision and knowledge of traditional patterns and flourishes, these strong arms hold a white, peaceful ring above the marrying couple, bearing down upon a strong, clean and natural centrepiece and seating arrangement for a ceremony to be undertaken. For a striking, positively regal touch to a ceremonial mandap, the Peacock Mandap is a superb choice for a couple in touch with their history as well as their spirituality. As with other mandaps available, the Saraswati Mandap can be decorated in a range of floral displays and flourishes, with ornamental decoration scattered carefully around the grandiose centre ring. 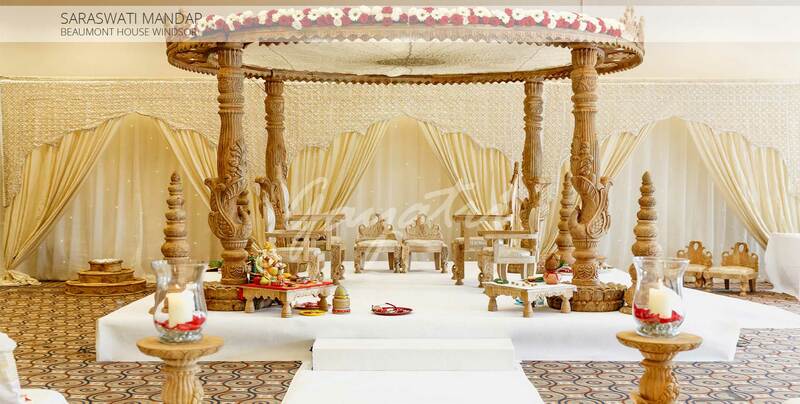 The Saraswati Mandap is a popular choice for couples looking to create memories from their wedding architecture as much as from their ceremony itself.